During this two-day Leading SAFe® training, you will gain the knowledge necessary to lead a Lean-Agile enterprise by leveraging the Scaled Agile Framework (SAFe®), and its underlying principles derived from Lean, systems thinking, Agile development, product development flow, and DevOps. You will discuss the five competencies needed to become a Lean Enterprise. You will also learn and practice the skills for supporting and executing Program Increment (PI) Planning events, and coordinating multiple Agile Release Trains (ARTs). You will gain an understanding of the Lean-Agile mindset, why it’s so effective in today’s adapt-or-die marketplace, and what it means to lead a Lean-Agile transformation. You’ll also learn how to build and support Agile teams and programs, empower a Lean Portfolio, build a Continuous Delivery Pipeline and DevOps culture, and coordinate large solutions. 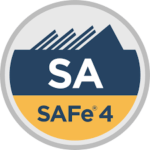 You will develop a skillset that’s in demand worldwide—and empower your enterprises to succeed in a disruptive marketplace—when you become a Certified SAFe® 4 Agilist (SA). Is Leading SAFe® the Right Course for You? Activity Number: ABOYTD2. Duration: 2 days.